A last minute penalty salvaged a point for Annan Athletic in a match they will no doubt look back on as a game that they should have won against a Montrose team who looked to have won the match courtesy of a dreadful error of judgement by keeper Alex Mitchell who got caught out in the 76th minute with his attempted clearance being blocked by Leighton McCintosh who ran in on a clear goal to give Montrose a 2-1 lead. Montrose started the match brightly but it was Annan who squandered a glorious opportunity in the 5th minute when Stuart McColm latched on to a through ball but his disappointing finish made it easy for Joe McGovern to save. It was a golden opportunity lost. Montrose took the lead in the 11th minute when Steven Day picked up a throw in to finish with a low shot into the bottom corner of the net. It was a move which caught the Annan defence sleeping but the clinical finish gave Mitchell no chance. Annan gradually got their game together and Stuart McColm’s 20th minute shot was saved by McGovern but the keeper was left to pick the ball out of the net in the 28th minute when Logan and Chisholm combined out on the right with Weatherson rising above his marker to head Chisholm’s cross back across the keeper and into the top corner of the net. The goal marked the start of a good period of Annan pressure with the Montrose defence having to work hard to contain Annan. McColms 30th minute dangerous cross flashed across the face of the goal, minutes later McGovern did well to save Weatherson’s dangerous free kick and the keeper could only look on as Weatherson’s 35th minute free kick flashed past the upright. As the game approached half time Annan were pressing hard and Weatherson’s attempted dink in the 43rd minute was saved by McGovern. 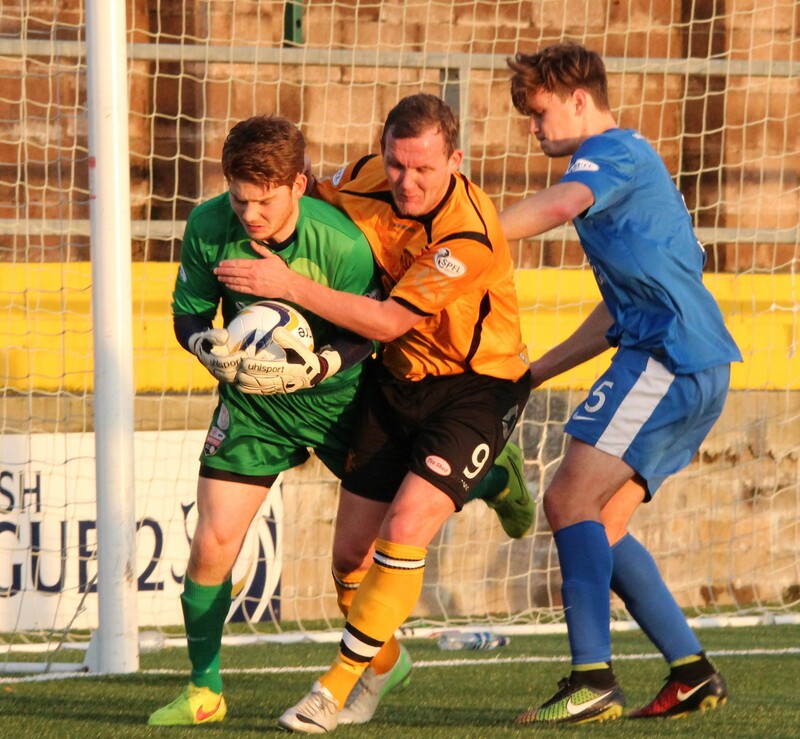 Annan started the second half on the attack and McGovern was called into action to deny McColm in the 46th minute. Annan forced a couple of corners which came to nothing and in the 56th minute McColm was denied when clean through on goal by another McGovern save . Hopkirk sent in a glorious low cross in the 68th minute as the Montrose defence was stretched. Annan looked in control of the game but the match took on a new dimension when the mistake by Mitchell presented McIntosh with the goal in the 76th minute. It was a rare moment in lapse of concentration by the keeper who has been outstanding for Annan. The immediate introduction of Josh Todd posed a new threat from Annan and the Montrose defence were being forced to defend deep and with time running out the visiting defence somehow withstood a period of intense pressure as the ball was cleared off the underside of the bar. Substitute Paul Harkins relieved the pressure for Montrose as he headed past in the 87th minute. Annan were awarded a free kick in the last minute of normal time when Montrose conceded a free kick 24 yards out and Weatherson’s effort was handled by Adam Harwood and from the resulting spot kick Weatherson converted to secure a share of the points for Annan. ANNAN ATHLETIC: Alex Mitchell, Steven Black, Iain Chisholm, , Martin McNiff, Peter Watson, Steven Sloan (R McStay 85 min), Matty Flynn, Steven Logan (J Todd 76 min), Peter Weatherson David Hopkirk, Stuart McColm ( J Todd 77 min) . Subs not used Jake Gemmel GK, Keiran Brannan, Jordan Brown, Rabin Omar, Connor Liddell. MONTROSE . Joe McGovern, Jonathan Crawford, Craig Bell, Gary Wood, Adam Harwood, Stephen O’Neil, Terry Masson, Paul Watson, Leighton McIntosh, Danny Cavanagh (Paul Harkins 69 min), Stephen Day (Bryan Deasley 78 min). Subs not used Ross Mcord, Steven Ross, Stuart McKenzie, Ross Graham, Scott Johnston. Montrose – S Day 11min, L McIntosh 76 min.